There are many David and Goliath stories these days, stories it seems we love to hear. Perhaps we are comforted to think our actions count, that we can really do something. 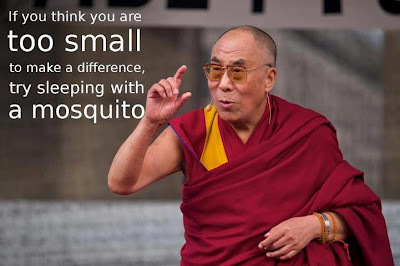 Even the Dali Lama gets into it with the famous quote, If you think you are too small to make a difference, try sleeping with a mosquito. I do not mean to discredit this. I believe it is true. But while what we do individually is important, but it is also critical that on some issues we act politically. Which brings me to the use of glyphosate (as in Monsanto’s Roundup) in weed suppression. The report recommendation: more studies need to be done immediately and should these findings be upheld, glyphosate’s use needs to be drastically curtailed. What is true in this statement is that glyphosate has a long track record of making a lot of money for Monsanto, its use having increased eightfold from 1992 to 2007. As we know, Monsanto is a powerful corporation, even trying insert its interests into the current 2013 Farm Bill in limiting states’ rights to require GMO labeling. In the face of these studies questioning the health risks of the use of glyphosate, one would think that the EPA would limit or prohibit its use. But no! Instead, the E.P.A. is actually considering increasing the limit. A deadline of 2015 has been set for review. This study is one of many that has been submitted. Individually we can vote with our dollars, not purchasing conventionally grown, unlabeled GMO food that almost certainly was sprayed and has glyphosate residue in it. This includes corn and any corn product, soy, canola oil, cottonseed oil, sugar beets, tomatoes, squash, potatoes, Golden rice, any meat fed non-organic grain (soy and corn), and GM salmon. If it is not certified organic or if you do not know your farmer’s practices, don’t buy it. Children and the elderly are particularly vulnerable to GMO foods and the residues of glyphosate in them. Stop using all glyphosate products such as Roundup in your yard, driveway, or in farming. (Paradoxically, when we stopped using Roundup in our vineyard, we stopped getting as many weeds.) Weeding and mowing are work, but they are honest and healthy occupations. But it is also time to act politically. Consider contacting your congresspeople and the EPA, and donate money to organizations such as Organic Consumers Association which work politically to make sure these studies are taken into account. We cannot let ourselves be bullied by multinational corporations. It is one thing to find out a product that we thought would make life easier actually is harmful. It is quite another to have corporate interests override research that questions their product at the cost of the health of so many of us, lobbying our legislators for their own interests. Glyphosate enters the waterways and our food chain, reminding us that we are one. What impacts any one of us may well impact us all. To continue pushing products shown to be harmful, to suppress our right to know that these harmful products may well be in the food we ingest, all in the name of corporate profit, becomes something very big. Then it can even be called a crime against humanity. Of Critical Importance: The Senate will take up the 2013 Farm Bill this week. In March Roy Blunt (R-Mo) sneaked in the Monsanto Protection Act requiring the Secretary of Agriculture to grant a temporary permit for planting or cultivating a genetically engineered crop, even if a federal court has ordered the planting be halted until an Environmental Impact Statement is completed, into the emergency Continuing Resolution to fund the government through September. It was signed into law! Support Jeff Merkeley’s (D-Ore.) amendment to the Senate version to repeal the Monsanto Protection Act by signing this petition and then calling your senators.